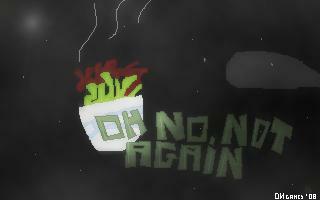 Adventure Game Studio | Games | Oh no not again! Download Oh no not again! A bowl of petunias along with a sperm whale at all improbability against fell from the sky, the whale thinks of many things, but the bowl just says "Oh no not again!" Short/Experimental game. The download link doesn't work, and I couldn't find the game. "This game consists of one animation, simulating something falling through the sky. After a while there is a text message." Download link doesn't work. It redirects on some page on www.savefile.com, that nowadays is just domain parking.